Market survey indicates an acceptance of using workforce analytics in organizations to manage and report HR data, but reveals room for greater improvements in the solutions organizations are selecting to use, to manage and report their workforce analytics. Visier Inc. released today a 2012 Survey Report of Employers: Workforce Analytics Practices, Preferences & Plans indicating that more than three-quarters of employers who participated in the survey are using workforce analytics to make informed decisions about their human capital and talent management and 65% of respondents felt that employee performance was a key indicator of success at their organization. Some key findings include that 78% of participants reported currently using a system that enables them to manage and report workforce analytics, while 22% do not have such a system in place. Spreadsheets and single-source solutions built into existing applications remain prevalent, with ease-of-use the improvement, most likely to improve success in workforce analytics. Clearly, the survey indicates that there is an acceptance of using workforce analytics in organizations to manage and report HR data. However, the survey also revealed that there is room for greater improvements in the solutions they are selecting to use, to manage and report their workforce analytics. When asked what would most aid their success, 30% of participants said they would benefit from "easier-to-use" analytics tools, and 23% felt they would benefit from an improved ability to interpret and present workforce data. "This survey highlights the still tremendous opportunity for customers to improve the effectiveness of their most expensive asset - their people. 90% of respondents claim to be using spreadsheets for some or most of their workforce analysis," according to John Schwarz, Founder and CEO of Visier. "Spreadsheets are subject to poor quality data, loss of version control and inconsistent interpretation. Well-designed workforce analytics provide reliable and consistent answers to business questions; companies that adopt such solutions are proven to outperform those that don\'t. Our advice is to take the plunge - find out what is really happening with your people!" In February of 2012, HRmarketer Services Group surveyed over 150 U.S.-based employers regarding their workforce analytics practices, preferences and future plans. The respondents that participated in the survey represented a wide variety of organizations that use workforce analytics to varying degrees. These organizations ranged in size from less than 1,000 employees to organizations with well over 10,000 employees. The majority of the participants worked in an HR role, although a small demographic represented senior management, and other departmental groups such as IT and Finance. The survey was conducted online on behalf of Visier Inc.
Visier Workforce Analytics is an end-to-end, cloud-based application designed for HR professionals to easily identify and improve the ROI of their organization\'s human capital. Companies can reduce costs, improve productivity, attract and retain top talent and implement a workforce strategy that supports the business strategy. Visier Workforce Analytics is a powerful, intuitive and interactive solution that uncovers deep insight into the core metrics of your workforce, by answering the most critical and fundamental questions facing HR professionals about their workforce, and more importantly, with predictive what-if analysis helps to predict and plan for their future needs. This survey highlights that while a large number of organizations have tools in place, an investment in solutions that improve ease-of-use and the ability to share data will aid in the success of workforce analytics initiatives. When integrated with business analytics, workforce analytics improves an organization's human capital ROI and increases the value its workforce delivers to its overall performance. 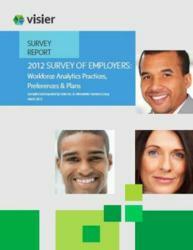 To read the complete survey report "Workforce Analytics Practices, Preferences & Plans," please visit http://info.visier.com/workforce-analytics-trends-research-report/?utm_campaign=HR.Marketer-Trends-Report-PR&utm_source=Press%20Release. Headquartered in Vancouver, B.C. and Menlo Park, Calif., Visier delivers workforce analytics through the cloud to empower HR professionals with the most critical insights for optimizing their people strategy to meet their business strategy. Visier's unique analytics combine the sophistication of predictive capabilities with the ease-of-use of consumer applications. Founded by business intelligence experts—including former Business Objects chief executive officer, John Schwarz—the company's leadership team has a proven track record of technical, operational and strategic management success with companies such as IBM, SAP and Symantec. For more information, visit http://www.visier.com or call 888-277-9331.